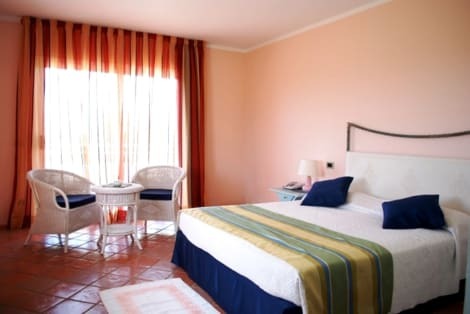 This hotel is situated on the north coast of the island, in a peaceful location, only around 2 km from the tourist district of Olbia, where a variety of shops and entertainment venues as well as various attractions are to be found. The transfer time to Olbia airport is around 10 minutes away by car. This hotel was completely renovated in 2004 and includes 49 rooms, which are spread throughout 12 elegant villas. A lobby awaits guests with a 24-hour reception service. Dining options include a pretty restaurant with an outdoor terrace and a stunning view of the sea (highchairs for infants available). Further services include a car and motorbike rental as well as an excursion counter for tours in the neighbourhood. Those arriving by car may make use of the hotel car park. The stylish rooms come with a bathroom and a small, furnished terrace. Further facilities include a direct dial telephone, satellite TV, a minibar, a hire safe and air conditioning. In the outdoor complex guests will find a swimming pool and a sun terrace with sun loungers and parasols laid out ready for use. Breakfast is offered in buffet style each morning. Guests are able to book half-board stays for which a set dinner menu is available. Those arriving by car, drive from Olbia along the coastal road towards Golfo Aranci. The hotel is located 2 km along this road. Boasting a vast garden, outdoor pool with sun terrace, and a hot tub, Hotel Alessandro is between Olbia and Pittuloungu, both 5 minutes' drive away. The restaurant offers a modern re-interpretation of traditional Sardinian cuisine. All the rooms are spacious and flooded by the magnifient sardinian sun. You may also decide to bask in the sun from the solarium or the side of the swimming pool. The pool enjoys a breath taking view over the gulf of Olbia. Luna Lughente is 2.5 km from the beaches in Pittulongu and 5 km from Olbia city centre. Its swimming pool and garden offer panoramic views of the Gulf of Olbia. Rooms have a minimalist design with Mediterranean-style décor and free WiFi. They provide air conditioning, satellite TV and a minibar. Some have a terrace and sea views. The property offers free Wi-Fi in its spacious lobby, which features wood-beamed ceilings and large windows. The restaurant serves Mediterranean cuisine with fresh fish and homemade pasta. Cocktails, drinks and ice creams can be enjoyed at the sea-view bar. Olbia Costa Smeralda Airport is a 10-minute drive away, and a free shuttle service is available. The beaches of Porto Cervo and Golfo Pevero are 30 km away. This club resort is located on the outskirts of Olbia and is surrounded by 14 hectares of Mediterranean vegetation. The hotel lies on a hill and offers a fantastic panoramic view of the wonderful harbour as well as the gulf of Olbia. The centre of Olbia, with a diverse range of shops and entertainment venues, is within a 5 km of the hotel. The establishment offers a lobby with a piano bar, 11 well-equipped rooms for conferences and 3 small shops. Dining options include 2 bars and 2 restaurants. The luxurious rooms come with a private bathroom and a living area with a double or king-sized bed and a balcony or terrace. An attractive pool area with 2 different pools and a separate children's area are located in the hotel grounds. Variety of sports activities are offered, including squash, archery and basketball. The new health spa offers a solarium, a Turkish steam room and a Jacuzzi. We have to inform you that, because of maintenance works, the area with Sauna, Turkish bath, hydro massage pool, relax room in the Wellness Centre will be not available from the 07th to the 11th of November included. 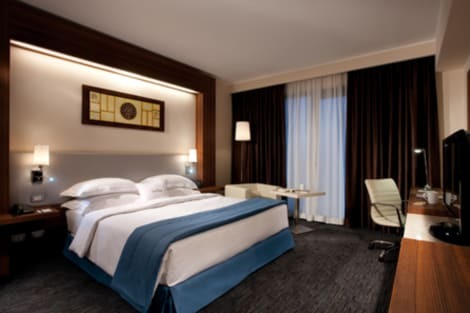 Make yourself at home in one of the 60 air-conditioned rooms featuring minibars and LED televisions. Complimentary wired and wireless Internet access keeps you connected, and digital programming provides entertainment. Private bathrooms with bathtubs or showers feature complimentary toiletries and bidets. Conveniences include phones, as well as safes and desks. The Doubletree by Hilton Olbia-Sardinia hotel is located in the heart of the Sardinia port city of Olbia. Known as the gateway to Gallura region's popular shops, clubs and restaurants, the area is famed for the many hidden beaches along the beautiful Costa Smeralda. This modern Olbia hotel is adjacent to the city's central park, Fausto Noce and boasts a stunning sea-front location. Enjoy picturesque sea views from the modern Guest Rooms. Relax in an armchair in the spacious rooms to enjoy on-demand movies on the 32-inch flat-screen TV. Step up to a Suite for the best views of Olbia and upgraded room amenities. All rooms at the Doubletree by Hilton Olbia-Sardinia offer high-speed internet access. Relax by the outdoor pool or in our wellness center, enjoy a round of golf at nearby Pevero Golf Club, home of Costa Smeralda Golf Academy. Savor classic Italian cuisine at Tilibas Restaurant or unwind with a drink at the Flamingos Bar. Plan your event in one of 4 modern meeting rooms and take advantage of the complimentary business center. Whether business, vacation or romantic break brings you to the Doubletree by Hilton hotel in Olbia, our helpful and friendly hotel staff look forward to welcoming you to Sardinia with our warm Doubletree chocolate chip cookie at check-in. The Doubletree by Hilton Olbia hotel is 100% non-smoking. Take time to pamper yourself with a visit to the full-service spa. If you're looking for recreational opportunities, you'll find a spa tub, a sauna, and a 24-hour fitness center. Additional features at this hotel include complimentary wireless Internet access, concierge services, and a television in a common area.